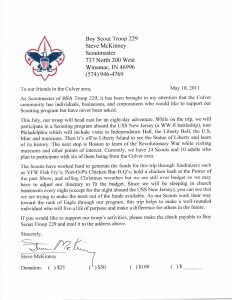 We received a solicitation from Boy Scout Troop 229 which is serving Culver now. 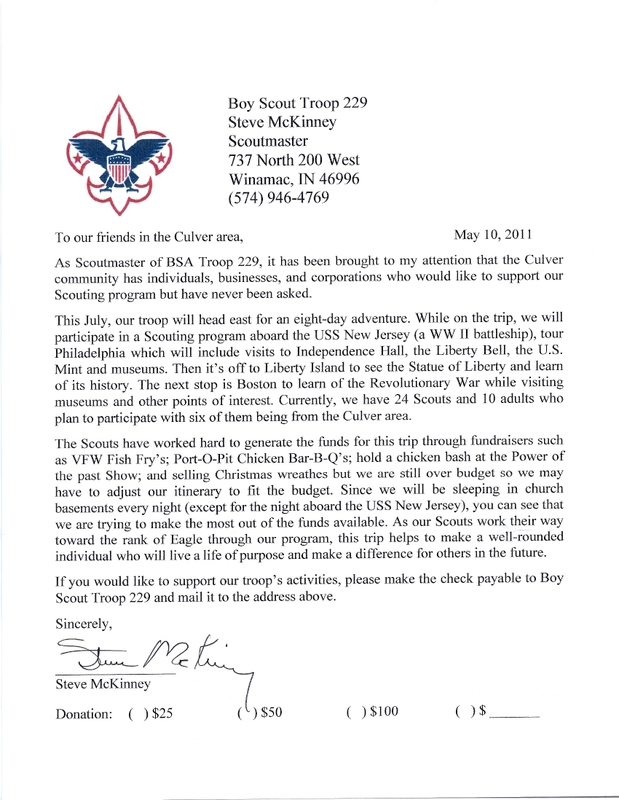 They have 6 scouts from the Culver area in the troop of 24. They are planning a trip to Philadelphia (Independence Hall), New York (Statue of Liberty) and Boston to visit and learn about historic sites. The trip will include an overnight stay aboard the USS New Jersey which should be a treat. I went through the scouting program, from Cub Scouts to Boy Scouts, and it is generally a good program. This trip sounds like it should be a great learning experience for the scouts. Since I was unfamiliar with this activity before receiving this letter about it, I thought I would share it here. Last year was the 100 year anniversary of Scouting in the United States. Something I learned when we completed the Boy Scout Cabin at Culver Woodcraft Camp last year. It’s a good program and hopefully these scouts will learn a lot and volunteer to pass it on to the next generation.